RTU was the acronym for Replacement Training Unit. I think it was called this because they wanted to replace our previous concept of flying with a different one: combat airlift. 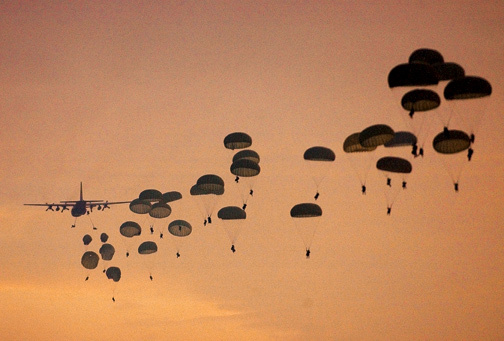 Combat airlift is all about delivering the goods to places that are inaccessible to airline-type airplanes. That means landing on short, unprepared airfields, and when even that isn't possible, doing airdrops. My first landing was more of a crash-and-dash than a touch-and-go. We practiced backing the airplane and did a windmill taxi start (which was sort of fun). Valuable practice. In just a few months, backing the airplane and doing windmill taxi starts would be pretty routine. But that was the easy part. That was the hard part. To land on short dirt airfields we used what was euphemistically called "max effort" landing technique. We flew the approach to the runway a few knots above the power-on stall speed to minimize touchdown speed and landing roll. In my previous flying we strived for grease job landings in the first 1000' of a 10,000' runway. The new requirement was to touch down in the first 100' of a 3000' runway. To put that 97' airplane into that first 100', you don't try for a grease job--just drive right on into the ground. While approaching and landing you're focusing hard on flying that airplane, but you must immediately force your brain to re-focus on stopping it. When the main gears touch the ground (and before the nose gear touches down) you have one second to get on the brakes and put the props into reverse pitch. The deceleration is reassuringly strong as you slow that 50-ton beast. Not much runway remains and the props are creating a dust cloud that is quickly catching up to you. If you brake too hard the dust cloud will overtake you and you won't be able to tell whether you're going off the side of the runway. (Did I mention that it was only half the width of the airplane?) If you don't brake hard enough, you'll go off the end of the runway. So you reduce the power "just enough" until you stop the airplane. And then your legs shake. If God had meant for this beast to be landed on 3000' of dirt He would have equipped it with tennis shoes or at least a tail hook. 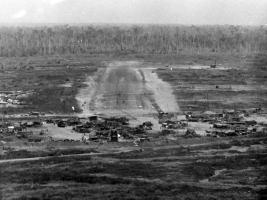 The Normandy LZ was about 1/3 the length of a commercial airport and made of red clay. 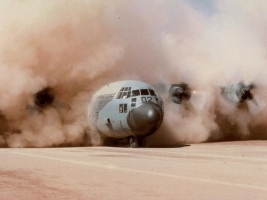 Lots of C-130's practiced there and each time one landed or took off, the runway disappeared in a dust storm for about 30 seconds--not a problem unless you are about to touch down. ...the pre-SEA cardiac check. Each crew member is allowed a maximum of one heart attack per landing. In this picture the dust cloud is overtaking the airplane and the copilot has put his hands on his head shouting, "We're going off the end!" Or maybe he's just holding the headset closer to his ears to drown out the noise. Landing on a short field at night is tougher because you lack visual references. Instead of nice approach lights and runway lights there are a pair of lights 100' before the runway, a pair of lights at the approach end, and another pair 100' down--about 1 candlepower each. You just descend down through the darkness toward the middle set of lights. Suddenly the landing lights illuminate the ground and two seconds later you drive the airplane into the dirt. "Any landing you walk away from is a good one." It's midnight--just got down from my flight--what a gaggle. 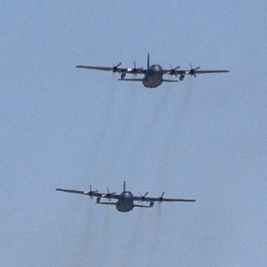 We had 7 aircraft in the formation. Only 2 got airborn together. 3 had maintenance problems, we were late getting our paratroopers, and there was one runway abort. We just flew the low-level & drop by ourselves--probably just as well. By the time we got back to Pope, one guy had a landing gear problem and had to chain the gear down, another had a runaway trim, another had a fluctuating prop, another had false indication of a crash position indicator unlocked, and we had a smoldering VOR set in back. I think every aircraft had something wrong. Nothing dangerous, but just a pain in the the neck. On ours, the loadmaster disconnected the cannon plugs to the recalcitrant dynamotor and that cured the problem (we still had to land and let the fire chief examine it and get the wing commander's approval to take off again). So we took off and... latched onto the wing of another guy near the drop zone. His copilot turned on the green light too soon and they dropped about a half mile short of the DZ. The LZ's were closed because they were too muddy, but I got some good landings in at Pope. After a successful night troop drop we headed for St. Mere LZ for night assault landings. After we'd made 2 landings another aircraft had a momentary fire warning on takeoff run. He asked us to go back to Pope & bring some maintenance men out to St. Mere to fix it. Meanwhile there's always a fire engine at the LZ just in case. The firemen decided to check things out and got the fire engine mired up to the axles in mud. So we got the ALCE (AirLift Control Element) to send out a wrecker for the fire engine, a guard for the airplane, and a bus for the crew. Never have I seen a check ride like this! I passed with flying colors, but what a gaggle. Of the 4 aircraft, one didn't make it for maintenance reasons, so 3 of us pressed on. Half way around the route our elevator trim failed, but we got the drop done OK and we landed OK using the emergency trim. Meanwhile, the 4th airplane cranked up, so our navigators jumped on that one. I still needed an assault landing to complete the check, so we hopped onto the #3 airplane. I got in the seat and made a max effort takeoff. About 20 seconds later the nacelle overheat light illuminated. That's grounds for an engine shutdown. But the light went out shortly thereafter and we pressed on. I made a full-stop assault landing and Pope and it was a good thing we did, because as we taxied off the runway the engineer noticed massive hemmoraging of hydraulic fluid from the flap well. That airplane must have had just one takeoff & landing in it. But we did complete the check and that's what counts. The flight examiner is going to Eglin AFB next week PCS, so he was thoroughly FIGMO and didn't even ask me any questions... What a piece of cake!